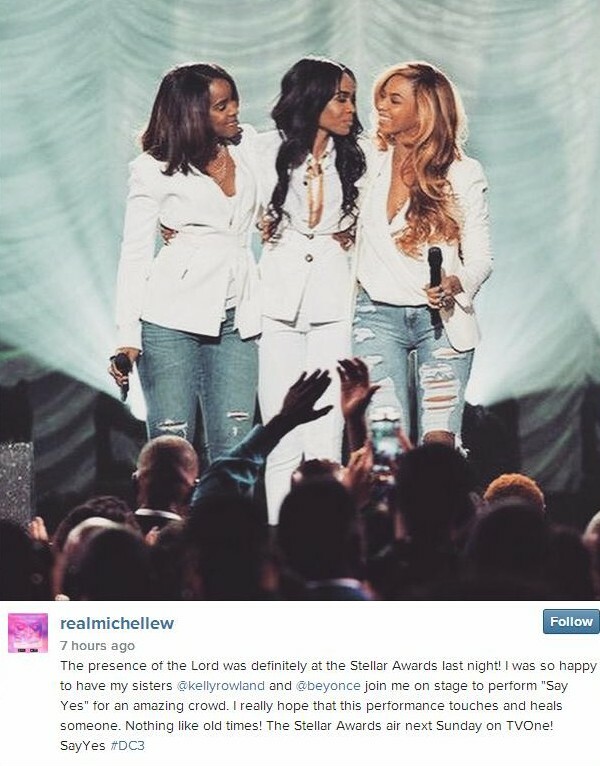 Beyoncé and Kelly Rowland joined Michelle Williams for a special performance of "Say Yes" on Saturday, March 28 at the 2015 Stellar Gospel Music Awards in Las Vegas. Michelle released "Say Yes" last year as a single from her "Journey to Freedom" album. The song's video won Music Video of the Year at the awards show, and Beyonce and Kelly joined her on stage to sing the song, marking Destiny's Child's first performance since the Super Bowl halftime show in 2013. After winning the award, Michelle posted on Instagram, "Thank you to each and every one of you that voted for #SayYes and a very special THANK YOU to @matthewacherry for directing this incredible video. And of course to my ladies to @beyonce and @kellyrowland for blessing the song. #StellarAwards." Say Yes to #StellarAwards30 #TVOneBTS . For this amazing performance join us Easter Sunday 6p/5c. Thank you @realmichellew @kellyrowland @beyonce for an amazing night. Destiny’s Child may not perform together very often, but that doesn’t mean they don’t reunite just as friends/family. Kelly was recently asked about a reunion, and she told Extra (via Gossip Cop), “The last reunion happened the other day when we all sat down and were just talking and enjoying each other’s company. It was awesome. Not every time you see Destiny’s Child together may be in front of the camera. We still have our bond amongst each other. That’s the most beautiful gift Destiny’s Child has given me."